This morning Veteran’s Day sent me on a hunt for old photos. I knew what I was looking for, but it wasn’t in my photo album, so I started pulling file boxes out of the cabinet of last resort. Most of those boxes are filled with pictures of dirt, alternating with picture of rust, pictures of water, and pictures of people moving dirt around, all left from our days as consulting archeologists. But one box holds a collection of snapshots of people and places, some that I can identify and some from so far back in Jack’s past that I have no idea what they represent. In that box I found what I was looking for, in a small brown envelope, mailed from Baltimore in 1950 and addressed in my mother-in-law’s spidery handwriting to Jack Hudson, somewhere in Pennsylvania. The postmark and address are so faded that I can’t tell more than that, but there were the snapshots I remembered, taken sometime in early 1945. 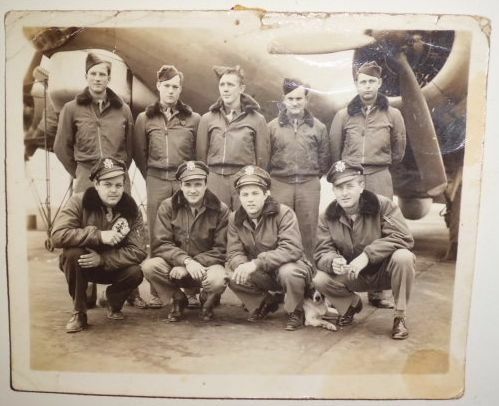 There are Jack and the crew of his B17, posing in front of the plane, maybe in Florida where they trained, maybe in England where they were based. Jack is the short, cocky-looking guy in the back row. The youngest and smallest man in the crew, Jack was the ball turret gunner, an especially dangerous position because the ball turret, located as it was under the plane, could be scraped off, gunner included, in a bad landing. When Jack took me to see the B17 at the Lone Star Flight Museum in Galveston, I was astonished: the Flying Fortress of its day is a very small plane by modern standards, and the ball turret is tiny and nearly inaccessible. 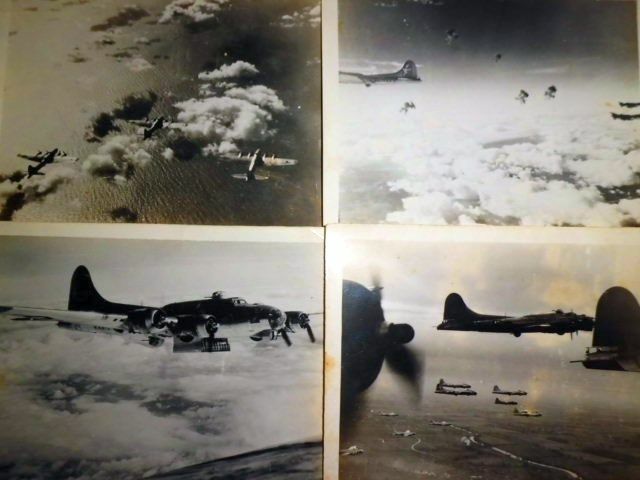 Jack joined the Army Air Corps in 1944. He was seventeen, and he hadn’t finished his senior year at the military academy he attended, so his mother had to sign his enlistment papers, but that was common enough at the time. (Some years later, all the boys from Jack’s class who had left to join the military were awarded their diplomas.) By the time he got to England, the war was nearly over, but he did fly on a few missions over Germany before it ended. In the envelope with the crew photo were several shots taken on one of those raids. Jack stayed in the reserves for years after he left active duty, serving as an administrative officer in a M.A.S.H. unit, helping set up a military museum in New Orleans, cooking cajun food and watching movies with a unit in Lafayette. When the first Iraq invasion began, he would have cheerfully gone to help–he always kept his name on the list of the “ready reserves”–but by then he was too old to be called back. He told funny stories about his service, and never complained. It was all part of the job, he said, even that atomic bomb test he’d witnessed out in the desert. And what had he learned from it all? Never pass a chance to eat, sleep, or go to the bathroom (that last not his exact words). Hey, that’s pretty good advice for anyone. You are such a gifted writer to find a way to end so poignant post with humor. Jack once convinced a guy in a bar that he (Jack) was a rocket pilot, based on his gunner-observer wings. The symbol on the wings looks more like a flying bullet to me, but Jack could be very convincing. I think he took that guy for a couple of beers.